Sale Sharks have named their team to face London Wasps in the Anglo Welsh LV Cup at Adams Park with a place in the Semi-finals at stake. Director of Rugby Steve Diamond has named his team for the game and has chosen an unchanged backline following last weeks bonus point win over Scarlets. Sale Sharks top their group but to stand a chance of qualifying for the semi final stages, Sharks know they need to win. Second in the group Leicester Tigers travel to meet Scarlets on Sunday and still have a chance of making the semis. 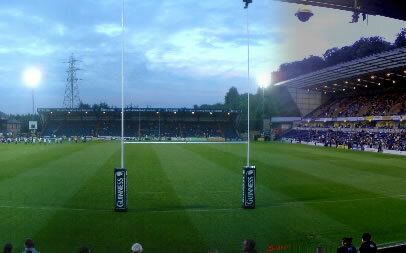 Sale Sharks have only made the semi finals once, that being on March 24th2007 when they lost to Leicester Tigers in a double header at the Millennium Stadium 19-29. 28,000 watched the game. Tigers went on to win the competition that season with a 41-35 win over Ospreys. London Wasps cannot progress to the semi-finals of the LV= Cup and their 8-34 defeat at Leicester last Saturday ended a six game winning run in all competitions. London Wasps have a perfect played 10, won 10 record at Adams Park this season. Sale Sharks are bidding to reach a first Anglo-Welsh semi-final since 2007 and need a bonus point win to guarantee their place – less and they will need to outscore Leicester by at least one match point. The Sharks have lost all eleven away games they have played in all competitions this season. The two sides have never met in the Anglo-Welsh Cup before, whilst Wasps won 25-18 when the two met in the Premiership on 23 December. London Wasps have named Stephen Jones in the starting line up and have moved Tommy Bell to fullback and Jack Wallace to the wing in the place of Tom Howe. On the other wing, Tom Varndell returns to a starting berth, moving Jonah Holmes into the centres in the place of the injured Chris Mayor. In the pack, Zak Taulafo starts in the front row in the place of Tim Payne, while Marco Wentzel returns to the starting team in the place of Will Rowlands, who moves to the bench. Sam Jones once again captains the team from number 8. Referee: David Rose (RFU) 9th competition game. Assistant Referees: Darryl Chapman, Matthew Carley.